I have battled issues with weight all of my life. I bet you have too. As a matter of fact, I once weighed 430 pounds. It’s really true. Ask anyone who knew me back then less than 10 years ago. Teresa Parker on left in 2004 at 430 pounds. 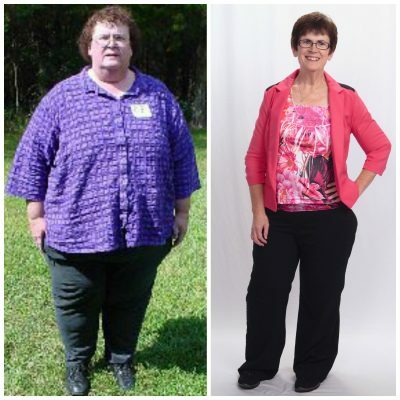 Today, she has lost more than 250 pounds. I am a writer so it was a logical step to write a book about my weight loss. But it’s awfully embarrassing showing the world you once weighed 250 pounds more than you do now. I found it exceedingly difficult to cram my life into 250-plus pages to tell the story. The story was no fun to write. It was akin to what it must be like to go through hell and then have to go back through again. Super morbid obesity is certainly not super and sadly it can be a morbid subject. Life in an extremely overweight body is fraught with diseases, which can culminate in untimely endings. Not only that but add always being afraid of breaking chairs, pointing fingers, fitting through doors and not knowing how to answer rude comments. The main issue for me has always been that I wanted to have my cake and eat it, too. I wanted an easy cure for taking off the huge amount of weight I had amassed, but I wanted to keep eating anything and everything I loved. Yet, still I persisted, eating whatever, whenever. Until the day a rather rude doctor said, “Your body is too big for your heart. Lose the weight or you will die in five years.” Then he turned and walked out of the room. You would think that would change me, right? It had a profound impact on me, which I share in the memoir. However, nothing really changed in my outlook regarding food until I realized I had a harmful relationship with sugar, and bread. They managed me rather than the other way around. The key for me was simple really. Part of it had to do with changing my mind about food. The other was the hard part. That part I talk about a lot more in the memoir. I will go out on a limb here and say I believe every person who is morbidly obese has the same issue I had. And the cure is the same difficult one I had to implement and though at one time I did have weight loss surgery, that is definitely not the cure I am talking about. I am a writer. All my life I have written stories about other people. I have always wanted to write a book and have asked God many times for the plot of the book I am to write. This year, it was as if He tapped me on the shoulder and said, “It’s time for you to get in the game.” I don’t know who I got sent in for, but the coach definitely called pushed me out there where the big boys play. Reducing my life to to fit in a book was hard for this wordy writer. Even now I think of things I want to add. I’ll share those in upcoming blog posts, I’m sure. The more difficult part, though, was reliving the years I battled my demons, as my daughter so aptly puts in the part she shares in the book. That alone is worth getting the book to read. It is, of course, my favorite part. Now, the book is written and will soon be bound and ready for distribution. In the meantime, I have the ebook version and I am just bursting at the seams to be able to share it with you. Here’s what I want to do. If you pre-order the actual hold-in-your-hands book before Oct. 23, I will send you the ebook free. When the real book (can you tell my preference) comes in, I will autograph it and send it on its way to you. That’s right I’ll autograph it. That may not be such a big deal once you try to read my handwriting. Many people have told me they can’t wait for the book to come out, so this is your chance. You are some of the first to hear about and take advantage of this offer. I don’t even know if my web designer has made the change to the order form to show that you get the free pdf yet, but if you pre-order I will personally send it to you. Let your friends know about this offer. It is only good until Oct. 23, the date the book goes up on Amazon. However, even after that date you can order the paperback, epub/pdf and kindle version from my website. 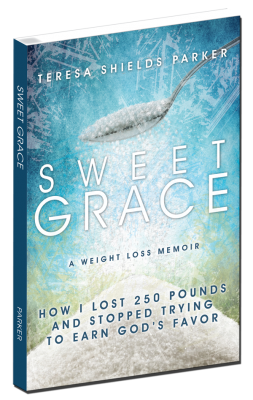 I believe my story can set others who have weight issues free because it points to my Creator who kept giving me the formula for success, over and over and over again. Get your ebook NOW. I can’t wait for you to read it! Then come back and tell me how the story helped you. Teresa, thanks for the courage shown in opening up first to yourself and admitting your problem, and then boldly sharing it with the rest of us. I battle cravings for carbs too, and I have just preordered your book and can’t wait to read it. I’ll also be sharing this with my followers. Good luck! Awesome Sherrey. I wish much grace on the journey and lots of good support and accountability.